To avoid any lacuna, the party has appointed the Chairman of the Board of Niger Delta Development Commission (NDDC) Senator Victor Ndoma-Egba as Uwajomuju’s replacement. Confirming the development in a telephone conversation, the National Publicity Secretary of the ruling party, Mallam Bolaji Abdullahi, said that the party hierarchy had since accepted the resignation of Uwajumogu. Abdullahi dismissed reports that the former secretary was forced to resign as a way of yielding to the demands of his state governor, Rochas Okorocha, who had threatened to dump the ruling party should his request for a new scribe be turned down. “It is not a tradeoff. 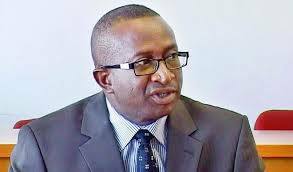 To the best of my knowledge, the reasons he gave were personal and the National Working Committee (NWC) has appointed somebody else, Sen. Victor Ndoma-Egba. “I do not know how that can be a tradeoff because if it is so, I think his replacement should have been another person from Imo, but the new appointee is from Cross River,” Abdullahi said. Announcing his resignation at a press conference in Abuja yesterday Uwajimogu said that he had to resign his appointment to attend to some family matters. Uwajimogu, who is one of the APC chieftains in Imo State that have been having a running battle with Governor Okorocha, over the recently conducted congresses, admitted that his governor has spent two weeks in Abuja doing everything possible to get him implicated. He also revealed that there were some other social media reports that he was forced to resign over financial misappropriation, stressing that his resignation will clear the air on some of the accusations against him. The senator explained that when he accepted the appointment he had believed that the convention would hold on May 14, saying that the new date of June 23 would clash with his long-term desire to attend the graduation of two of his children from universities in England. “I want to announce to you that on Friday. I tendered my resignation as the Secretary of the APC Convention Planning Committee and the resignation was accepted by the national chairman of the party. “The reason I resigned, primarily is that when I was appointed, the date for the national convention, as we were informed, was to be on May 14. Eventually that date was moved to June 2 and there were hopes that the convention would hold between June 2 and 9. However, the date has now been moved to June 23 and it will conflict with my family activities and responsibilities. “For example, two of my children are graduating from the university in England within this month and I have a responsibility to be there and I have some other jobs at hand too. So, I decided that since I won’t have the time for this convention, I should resign so that the position can be given to somebody who has the time. “It is a decision that I took by myself. In my letter I thanked the national chairman and the convention committee for all the support I received while I was here,” he said. On whether he was traded off to accommodate the interests of his state governor, Okorocha, whom he has had a running battle alongside other stakeholders, Uwajumogu said: “For me, my relationship with him is not a personal thing. It is something that all of us in Imo State are opposed to the way the government in Imo State is being run. “As a matter of fact, I am happy now that I have resigned, maybe it will be clear that the convention which is slated to elect national officers,… I am aware that the governor is supporting some South-east citizens to run for offices zoned to the region and so now that I have resigned, nobody will accuse me of manipulating the process,” he said. Does a woman’s body count really matter? should emulate him. There have been calls on many leaders to resign, but they refused as if the position is their birth rights. This is a good example by sen. Uwagimogu.